The pdfs in the download below (fixed now – sorry for any inconvenience) are all the same size and – if this works out as it should – when printed out everything should be in the same scale on paper. Model-makers should then be able to use the printouts as templates to create a 1/12 or so scale model, including spars and sails. One point that may not be obvious and which I haven’t explained is that included in the drawings are four panels whose purpose may not be obvious. In fact, these attach to the side decks, frames and bottom immediately before and aft of the central thwart. They’re intended to add some low-down bouyancy in a knockdown, and help to keep the amount of retained free water to a minimum on righting. Have fun… If you do build the model, I would be delighted to advise if you get stuck, and would be most grateful for photos please! Don’t miss something good – subscribe to the free weekly intheboatshed.net email newsletter now! What would you think about putting a lateen or maybe even a leg'o'mutton rig on her instead? Sorry – it's fixed now. I was in a big hurry last evening. My plan is to include an adjustable means of supporting the mast in order to allow good real world balance, and if the geometry allows I have it in mind to use this to allow an alternative balanced lug, which is a favourite in some parts of my country. On the leg of mutton, I'm less sure. It looks good of course, but it's worth being aware that this boat is as much a rower as it is a sailor, with the result that its hull isn't aparticulary powerful one – while the hard chine means it has a relatively high wetted area. So, I'd say the most appropriate rigs arerelatively low profile but with a good area – hence my choices. 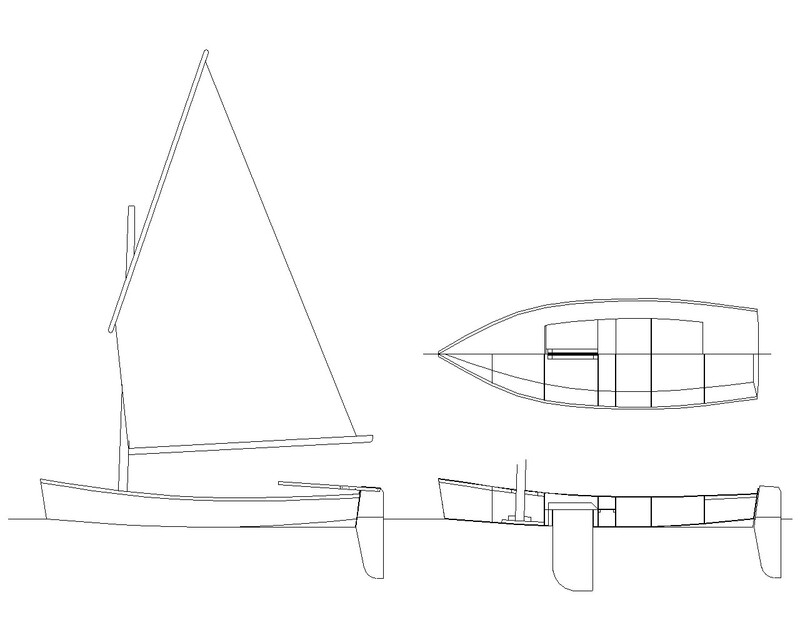 A peak sprit would work (and is trad for this kind me hull, which of course is a strong hint that it will work), as would a bafter and possibly a lateen too, though they'd look a little odd. I'd need to do a bit of research on that last option, as I've never made or used one. Am I right in recalling that they're cut flat and so are easy to make – or is that the crab claw? It's all a bit exotic for me at the moment!